I am SO into leather right now…and yes, I know how that sounds! But I’m talking about leathercrafting- specifically with old leather belts. And full disclosure- I’ve amassed quite the belt collection for my crafting pleasure. I’ve made fun cuffs that I used to sell in my Etsy shop…and other crafts that are posts-yet-to-be…but today, it’s all about the booze. And by booze, I mean leather liquor tags for decanters! So let me get to it. This post contains affiliate links for your crafting convenience. First, gather your leather. I have a penchant for camel- or caramel-colored leather belts for these tags. Then, using a craft mat and a rotary cutter, trim off a piece to work with (maybe 3.5”-4”). Before you begin stamping the name of your booze, however, you want to do what’s called “casing”. For a craft like this one, you simply need to rub the skin side (top) of your leather piece with a damp cloth/sponge- just enough to dampen it. Casing the leather helps it become supple which in turn improves the leather’s ability to take an impression (such as these alphabet stamps). Time to get my stamp on! Once you have successfully stamped the liquor name on the leather, it’s time to add the eyelets. Using a hole punch, punch holes in your leather on either side of the word and insert your eyelets (I used ¼” eyelets). Use an eyelet setter (same size as eyelets) and your mallet to secure them in the holes. Starting to really take shape! After the eyelets are secured, trim off excess leather on each end- now you’re ready to add chain to your liquor tag! Use a jump ring to connect one end of your tag with the chain of your choice. Then, I used a small piece of tape to hold the tag on my decanter to figure out where to open up the chain at the other end. Then, use another jump ring to connect the chain to the other end of the liquor decanter tag, like a bracelet. Ta-da! Isn’t it so cool? These would make such a great gift…for Father’s Day, housewarming, the holidays, and more! Thank goodness for all those extra belts- I’ll be making more of these, I suspect. Thank you for sharing on #TheWeekendSocial ! Loved your blog post! have a great night! Thank you, C! I’ve got more future leather crafts on tap…can’t get enough! Love these! What kind of alphabet stamps are you using? I assume they’re metal. Where did you find those? Very cool wine tag! Need to find a letter press — lots of fun could be made. Visiting from Inspiration Galore party. Beautiful!! What a great idea – Thanks for sharing on the Pleasures of the NW’s DIY party! I absolutely love these! I can’t believe just dampening the leather lets you stamp onto it—crazy! It is very cool and would be a great Father’s Day gift. What a beautiful project, Sarah! I know a couple of people who would really love & appreciate something like this. Thank you for sharing with us at Funtastic Friday! Ha! This is so neat! love this!! Very retro. Love them. Thank you for sharing at Vintage Charm. 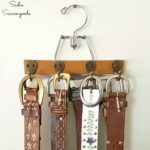 What a great repurpose of leather belts Sarah!